I have been to Venice in the heat and I have been to Venice in the cold. La Serenissima has warmed me with her sunshine and frozen me with her snowstorms. Along her canals I have sauntered on balmy days and hurried in the rain. Yet, whatever the weather, one aspect of the city has always enchanted me: her unbelievable beauty. No matter how many times I gaze upon her squares and palaces and churches, my mind cannot quite cope with the richness before my eyes. That, I suppose, is why I always feel the need to return. And when I do, I am drawn by another constant: the happiness of dinner at the Gran Caffè Ristorante Quadri. 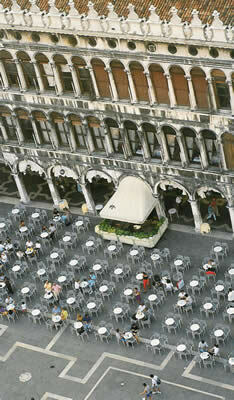 Venice was the first city in Europe to acquire, from Turkey, the habit of drinking coffee. Its first coffee shop opened in 1683, and the popularity of the new drink, and of the places in which it could be imbibed, spread quickly. About a hundred years later, a hopeful young fellow arrived from Corfu and took over one of the cafés in St Mark’s Square. Giorgio Quadri, sadly, was not a great businessman. His enterprise foundered, and it was left to subsequent owners to turn the café into one of the most fashionable of Venetian salons. Still, Signor Quadri did bequeath to us one thing – his name. It has stuck to the premises through the centuries. 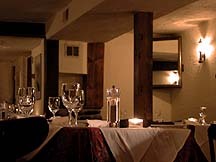 It was there when the first floor restaurant opened in 1844. It was there four years later, when the building became an infirmary for those injured in the fight to drive out the Austrians. 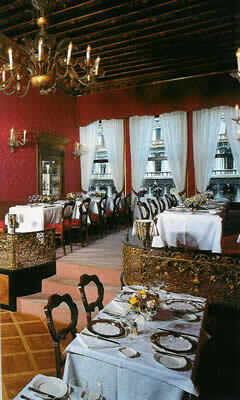 It was there in the 1850s, when the restaurant rooms were decorated with stucco and paintings by Giuseppe Ponga. And it is there today, over the door of the most famous dining room in Venice. I clambered up the stairs on my most recent visit with eager anticipation. I like walls covered with red silk and it pleases me to be lit by sparkling chandeliers of Murano crystal. Adriano Girardi, the Manager, ensures that it is all maintained to the highest standards. 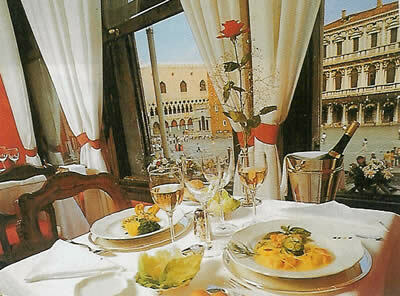 Best of all, to be able to eat while looking out at such a view – the floodlit Square, the soaring campanile and the Doge’s Palace – makes me feel like a potentate. And we all, surely, deserve to feel like a potentate once in a while. True, the tables here are small, but they are covered with crisp white damask and support high quality glassware (by Spiegelau), so the atmosphere is elegant and luxurious. As I watched the waiters in black tie (orchestrated by the charming maitre d’ Stefano Munari), lifting silver domes in front of my well-dressed fellow diners, I felt that the world was well. What was coming through the loudspeakers? It was the first piano concerto of Tchaikovsky. This was appropriate, for he used to be a customer. Indeed, virtually every other great person who has ever paused in Venice has spent a few hours at Quadri – including Wagner, Byron and Proust. The last, meticulous as ever, moved repeatedly from one table to another to escape the draughts. Not being peripatetic by nature, I stayed in one place and found myself both warm and draught-free. The wine list is short. It has one feature which I wish others would copy. 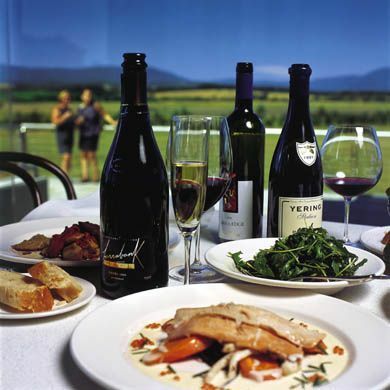 It notes the percentage of each grape used in the making of every wine. Prices range from 31.50 euros for a local white or a Lombardian red to 325 euros for Mr Gaia’s 1998 Barbaresco. The 2000 Sassicaia is 227.50 euros. I went for a big Sicilian chardonnay of toast, vanilla and alcohol (San Francesco in Regaleali, Tasca d’Almerita, 2002 – 75 euros), and a stern, tannic Brunello di Montalcino (Poggio alle Mura, Castello Banfi, 1999 – 108 euros), which was the ideal partner for the beef. Whether Venice is hot or cold or mild, I will never tire of her seductive charms. And when I am in Venice, I know where I must dine. At Quadri. Piazza San Marco 120, Venezia 30124, Italy.